Approaching from the Westside and I-69: For the near future, Tapp Road is closed at the intersection of I-69 (State Road 37) due to construction for an over-pass interchange. When construction is completed there will be great access from the west off I-69 due to this new overpass and removal of the stop-light. During construction we suggest you take the 2nd Street/Bloomfield Road Exit east and then turn Right onto Weimer Road. This road takes you all the way to Tapp near the building. Approaching from the Eastside on Country Club Road: When you arrive at the intersection of Rockport/Country Club Road (where it converts to Tapp Road) there are signs that say “road closed ahead, local traffic only”. You are still able to access BUGS as normal. Ignore the road closed signs. The good news is this intersection may have much less traffic and not so many cars backed-up at 5pm. Approaching from the South on I-69: If you are traveling in from Bedford or south of town, we suggest using the new interchange heading east at Rockport Road. This will take you all the way to Tapp Road where you can turn right and access the facility. Ignore the road closed signs at Tapp, you can still reach BUGS before it’s blocked. Approaching from the North in town: If you are traveling from Tri-North, or BHSN through downtown, we suggest using Rogers Road and then take a right onto Rockport briefly, and then right onto Country Side Drive. This will bring you in the backway past Summit Elementary. 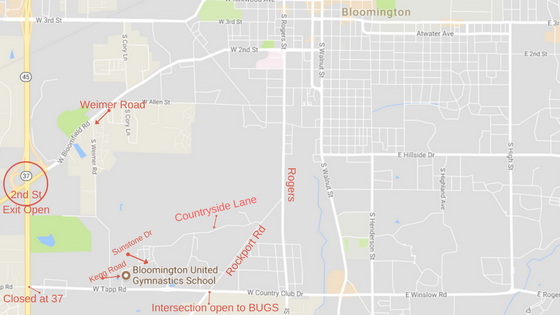 Turn left onto Adams after the school and then immediately turn Right onto Sunstone Dr., which brings you down to the backside of BUGS.